Other than a few new McMansions that have crept in, most buildings in the historic Gulf Coast town of Aripeka, FL are pretty small. Quaint and picturesque, set next to the Gulf of Mexico with spectacular sunsets every night, it's easy to envision a simpler coastal lifestyle in Aripeka. In particular, this quaint stilt shack that is less than 500 sf, built far out over the marsh makes one think of relaxing days swinging in a hammock with a cold drink in hand. Located on part of the Old Dixie Highway, the former Aripeka Post Office, next door to the newer (yet not much larger) Post Office built in the 1950s, also is a reminder of simpler days. It appears to be under 200 sf. 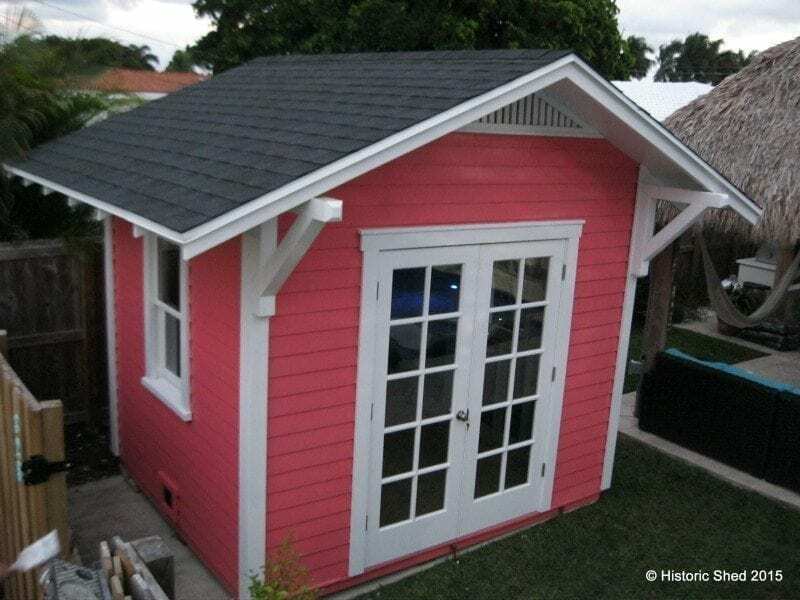 A fun, fact-filled article from Old House Journal on the history and evolution of the garage, the most common outbuilding found around historic homes in Florida. Because Historic Shed custom designs and builds each outbuilding to complement individual historic homes and homeowner's needs, we do not maintain an inventory of sheds like many shed manufacturers. Instead, when a new customer contacts us, we ask them to send a photograph of their home, including any details that they particularly like, and then have a discussion about the needs that the shed will accommodate. This includes whether it will be used for lawnmower and bike storage or serve as a home office or pool cabana. We then draw elevations of what the shed could look like and layout shelves and other built-ins to accommodate any special requirements. We generally provide a ballpark cost for the cost of constructing the preliminary shed design at this point as well. This initial design serves as a starting point to tweak the look of the shed to fit the homeowner's preferences and budget. Once a design is finalized, we provide an accurate cost of construction and begin the building process in our facility at the customer's approval. Most sheds are delivered in three-four weeks. If you have more questions about our design or production process, please call Historic Shed at (813) 333-2249 or email a photo of your home to design@historicshed.com along with your ideas for a perfect outbuilding.